So much more than just a good-looking face, Chalk has chosen the hottest man of the hour, Xian Lim, as the magazine’s cover boy for its “Beauty Issue" this October. Chalk Magazine’s “Beauty Issue” is all about going back to basics and knowing the true meaning of beauty—as something that exists in so many things. 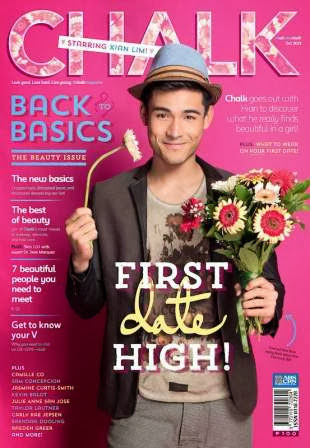 A vague and mythical term, Chalk seeks to unravel the true essence of beauty in this month’s cover story, where Xian Lim himself opens up to Chalk about what his thoughts are on real beauty and what he finds truly beautiful in a girl. Of course, he even goes into detail about the most beautiful girl in his eyes, Kim Chiu. Aside from all that, Chalk introduces to its readers the seven most beautiful people in the magazine’s “#beautiful” story under LIVE section. These seven personalities—Sam Concepcion, Jasmine Curtis-Smith, Abby Asistio, Kevin Balot, Ayumi Yoshikawa, Tori Rosso and Camille Co—are among those who redefine beauty in their own unique ways, demonstrating beauty in all its forms. Chalk even goes into the most gorgeous pieces to sport for the upcoming sem break and the top beauty essentials to achieve that au naturel look, all under LOOK section. LOVE section, on the other hand, has got features on inner beauty. Chalk is also bringing its final Bright Young Manila Campus Talk leg which is set to be held on Monday (September 30) at the AMV-COA Multi-Purpose Hall, 4th floor, Multi-Deck Parking of the University of Santo Tomas. The host for this last leg of Chalk’s campus talks will be this season's UST courtside reporter Kristelle Anne Batchelor, featuring the Bright Young Manila 2013 finalists and Chalk magazine’s editors with the special participation of supermodel-beauty queen turned broadcaster Tina Marasigan, who happens to be a former courtside reporter for UST—all eager to empower, educate and entertain the youth in order to bring out the best in everyone.